As Nicole and Maggie point out, there is no evidence that any of this is true. But there is plenty of evidence that repeating and endorsing these lies does real harm to trans/gay/genderfluid kids. The harm they are doing with their lies does not bother any of these people. And trying to discuss the issue with them will get you nowhere. Why? Because these people are not rational about their fear and hatred of trans/gay/genderfluid people. And we can see it when we try to provide such people with data about why they're wrong about their claims -- they dismiss any evidence that doesn't fit their claim, and frequently (as Rod does) resort to name-calling and more lies. (1) Kids are being manipulated by activists. This claim is put forward on no evidence whatsoever. The 'proof' that is offered is that the number of kids who say they're trans or gay or bisexual has risen over the past decade. "It's statistically impossible for this many kids to be bisexual," as one comment claimed. It's obvious to anyone who is trans or who knows trans people why more kids are admitting they're trans (or gay, or bi), and it's not because it's fun or cool to be LGBTQ. It's because ten years ago, admitting you were LGBTQ was a sure way to be abused, or fired, committed to an psychiatric hospital, or literally tortured. That's less likely to happen these days, though I know personally kids who were kicked out by their homes after they came out to their parents, or threatened with medical abuse, or whose parents quit paying for their education. (2) Parents are abusing their kids by (apparently) manipulating these kids into believing they're gay, or trans, or bisexual. Parents do this because it's 'cool' to have a trans or gay or bisexual kid, and they want the attention. Again, no evidence is put forward. Instead, transphobes and homophobes simply insist it must be true. Those of us with trans or bi or gay kids know what a bizarre claim this is, but again, no amount of evidence or attempt to argue has any effect. (3) Parents are forcing or allowing their kids to transition as young as five or six, putting them on Hormone-Replacement Therapy at five or six, getting them top or bottom surgery as young as five or six. 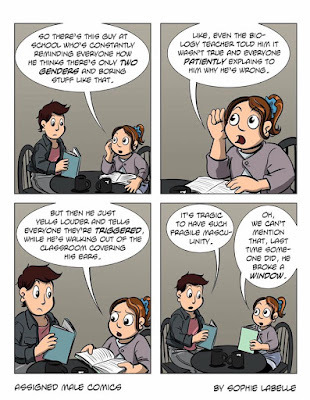 "How can a six year old know anything about their gender!" These TERFS/Transphobes wail. "When I was six, I wanted to be a purple unicorn! Should my parents have gotten me surgery for that?" Just FYI: No one is performing top or bottom surgery on children. And while some kids do have access to hormone blockers, that is not at all the same as HRT. They're not given to six year olds* (why would they be?) and for kids who have gender dysphoria, hormone blockers may be literally life-saving. Also, despite what many TERFs and Transphobes claim, puberty blockers are a well-tested and relatively safe drug. (4) Kids claim to be trans because our society discriminates again women, and tells women they're evil and icky, so this is a way kids can escape being female. This is a bizarre claim on the face of it, since no matter how badly women are treated in our culture, trans people are treated much worse. Also, obviously, only a certain percentage of trans people are trans masc/trans men. Why would trans women even exist, if this were true? (5) The medical profession is pushing kids into Hormone-Replacement Therapy, because reasons. Again, those of us who are trans or who know trans people know what a bizarre claim this is. It's extremely hard to get HRT, and no psychiatrist or therapist or doctor is just going to give it to a kid who shows up and says they're trans. (Nor will they medicate a child just because the parent says they're trans.) The process of obtaining HRT is lengthy, and usually takes years. Everyone involved is not just cautious, they are over-cautious. And this is partly because trans people are so discriminated against in our culture. And again, when evidence is provided to transphobes/TERFs who make this claim, they retreat into insults and mockery. It's as if the evidence that they are wrong terrifies them almost as much as the existence of trans people. Why are TERFs and transphobes so bothered by the existence of trans people and LGB people? Why do they get so rage-filled and out of control when facts and evidence are presented to them? For these people, gender rules must be strictly enforced. If a young boy can wear nail polish with impunity, then our entire culture is at risk. So what happens to such people when kids say they're trans? Or genderqueer? What happens when trans people come out openly as trans? Authoritarian people are terrified, and their terror drives them to irrational arguments and (worse) irrational behavior. Why Doesn't Everyone React This Way? For one thing, not everyone suffered an authoritarian upbringing. And some who have are able to overcome that upbringing. Most of us, in fact, are able to think rationally about the customs, rules, and laws of our culture. Most of us can listen to reason, and be persuaded that what our parents believed, or our preacher believed, might not always be true. We can change our minds when presented with evidence, in other words. Further, for many of us, gender roles and gender itself is a spectrum. Perhaps five percent of everyone is Rigidly Female, or Rigidly Male. These people are locked into gender, and for them it must seem like gender roles are as real as gravity. Others (like me) are somewhere in the middle. I remember, for instance, how outraged my mother would get when a clerk at the bank (for instance) misgendered her, and called her sir. When my mother got misgendered, she would snap angrily at the clerk (and my mother was never rude to people) and fume for hours afterwards. "Sir! Why would you call me sir? Do I look like a man?" Yet when I get misgendered, which happens a lot, since (as my kid notes) I'm the most butch straight woman ever, I could not care less. Yes, I'm cis. Yes, I'm straight. Yes, I'm a woman. But when someone calls me sir or mistakes me for a man, it bothers me not even a tiny bit. Why would it, is my reaction. I don't like how the law discriminates against women, or how many people deny that this discrimination exists. I don't like being expected to do more service work in the university than my male counterparts do. I don't like that I'm less likely to succeed in my chosen career than men are. I don't like that I'm expected to do most of the housework, and most of the childcare, and most of the management of my family's day-to-day lives (making all the medical appointments, for instance, and making sure those appointments get kept). But as much as I don't like these things, would I pretend to be trans to avoid them? That's just such a bizarre idea, and such a bizarre claim, that I can't believe anyone seriously believes it. It's so hard to be trans, and so hard to transition, as anyone who knows trans people knows. Why would I take that enormous burden on myself to avoid a much smaller burden? Also, that's just not how it works. You don't decide your gender. Your gender is what it is. I am indeed the most butch woman you will ever meet. I don't own a dress. I have never worn nail polish. I hate make up. My hair is shorter than most men wear theirs. I dress in jeans and teeshirts and Converse sneakers, pretty much 24/7. And yet: I am straight and cisgendered and solely attracted to men. That's not something I decided. That's what I am. They must know this isn't the case. And yet they repeat lies and misinformation premised on this claim. It's not rational. Ergo, it's irrational. But most fear is. First, the best advice I ever got about feminist was not to let people who hate feminists tell you what feminism is. Likewise, don't let TERFs or transphobes or homophobes tell you what trans or LGB or genderfluid people are like, or why they're doing what they do. Also, read widely. There is plenty of reliable information available. Seek it out. Above all, listen to trans people, and gay people, and genderfluid people. Let them tell you who they are, and what they want, and why they want it. Let them tell you what it's like to be them. And trust them. They're not lying. Why would they? *The exception would be a six year old who had entered into what is called "precocious puberty." That's got nothing to do with trans kids, though. NOTE: This post was written with the help of my excellent kid.